Go to enterpriseholdings.com/careers or enterprise.com/careers and land on to Enterprise Rent-A-Car careers page to find job opportunities for you. 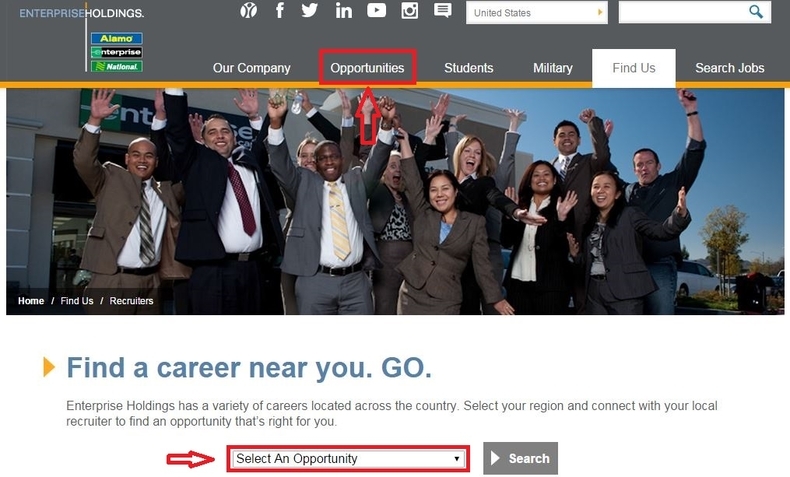 You can select an area from the drop-down menu of "Opportunities" or "Select An Opportunity" to search job opportunities for you. Here we select "Sales" as an area to continue. 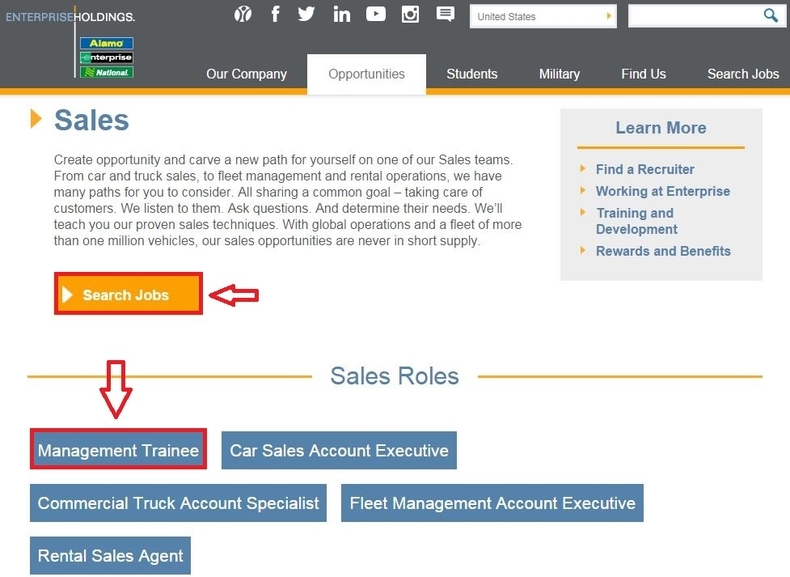 There are different roles in the sales area, among which you can select a role to search available positions for you. You can also click "Search Jobs" to view the jobs list in this area. 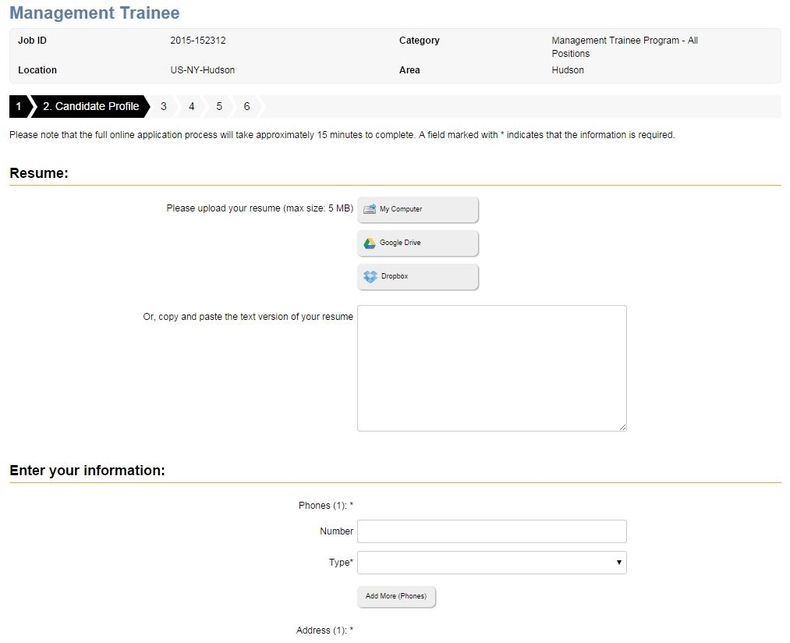 Here we choose the first role - Management Trainee to show you the job application process. Select the position that best fits you and click the job title to move on. After selecting a role, you will be entered into a page where you can see the available jobs list. 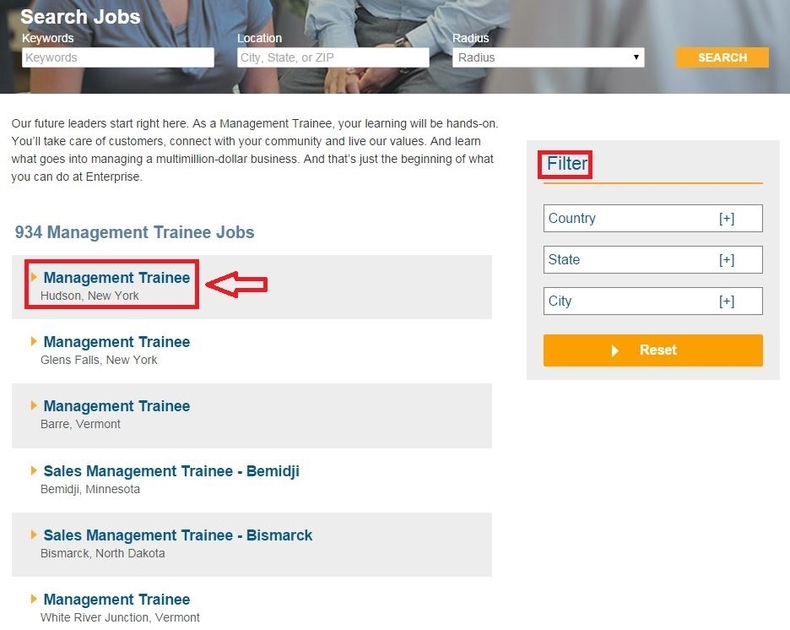 You can filter the list by country, state, city and then select the one you are going to apply for by clicking the job title. Here we choose the first position and set you an example on applying for it. Read the details of the position, especially responsibilities and qualifications carefully and think about if you are qualified to apply for the position. If you can not match the requirements, just go back to the list and find another position. If you are qualified to apply for the position, just click "Apply" at the bottom of the job details page to start your application. To apply for this job, you must create a profile. If you are a returning candidate, you may simply login to begin your application. Here we choose to build profile through creating online form. 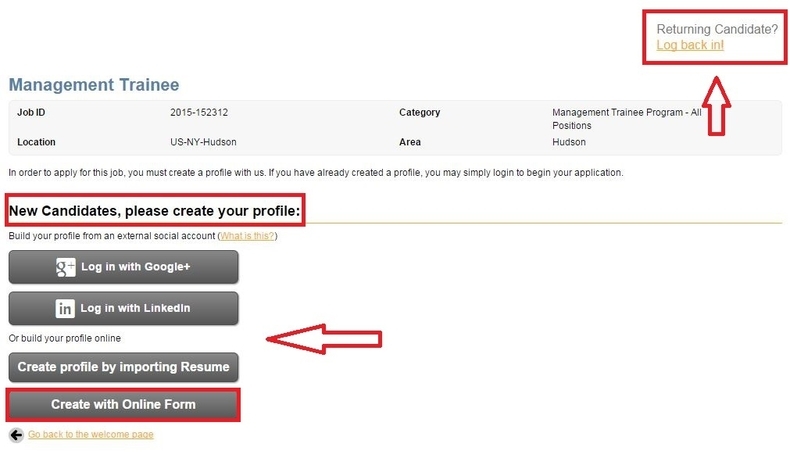 Complete your candidate profile by uploading your resume, providing your personal information and references. Please notice that the fields marked with asterisk are required. Complete an online employment application form by filling in information regarding your personal details, education information, employment information etc. 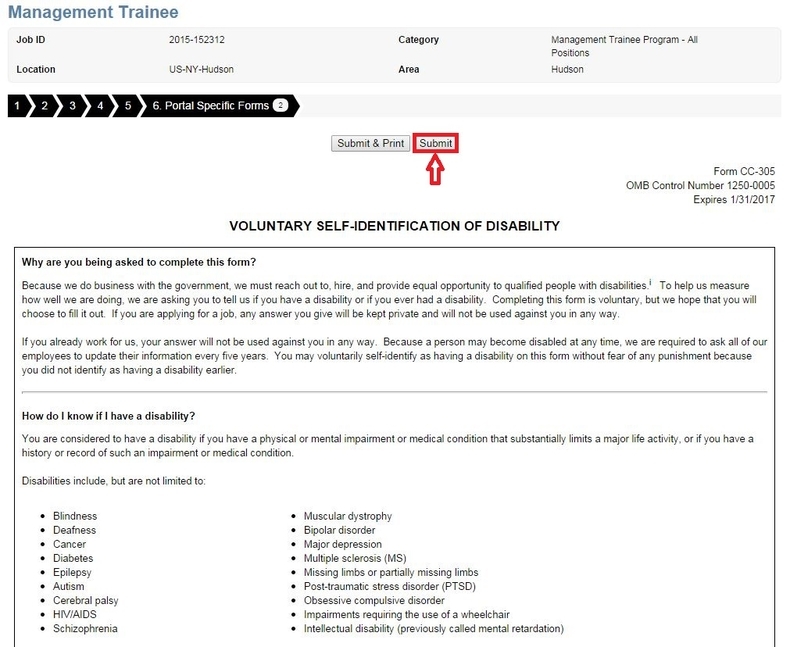 and then click the box to certify that all the information provided on the form is true and correct. 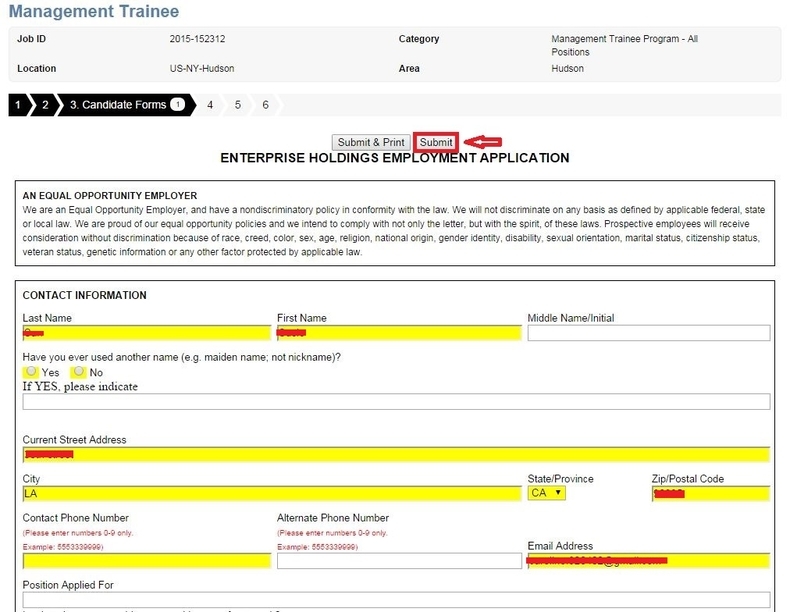 The yellow areas are required fields. After you finish all the required fields, just click the button to submit your application. Follow instructions to complete the rest steps like providing voluntary information, answering some job specific questions. After you finish the required fields marked with asterisk in each step, just click the button "Submit" to move on to the next step. 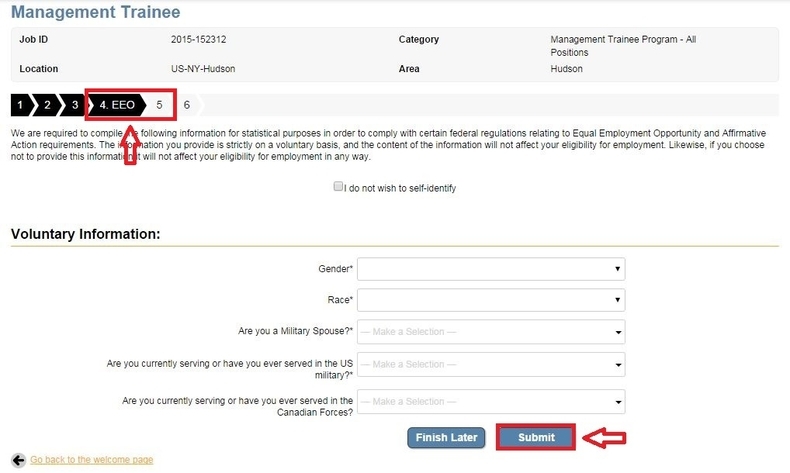 Finish the last step by indicating your status of disability and veteran, clicking the box to leave your signature and then tap the "Submit" button to submit your online application. When you finish your online application, you will see a Thank You notification which indicates that a member of the recruiting team will contact you within 5 business days. 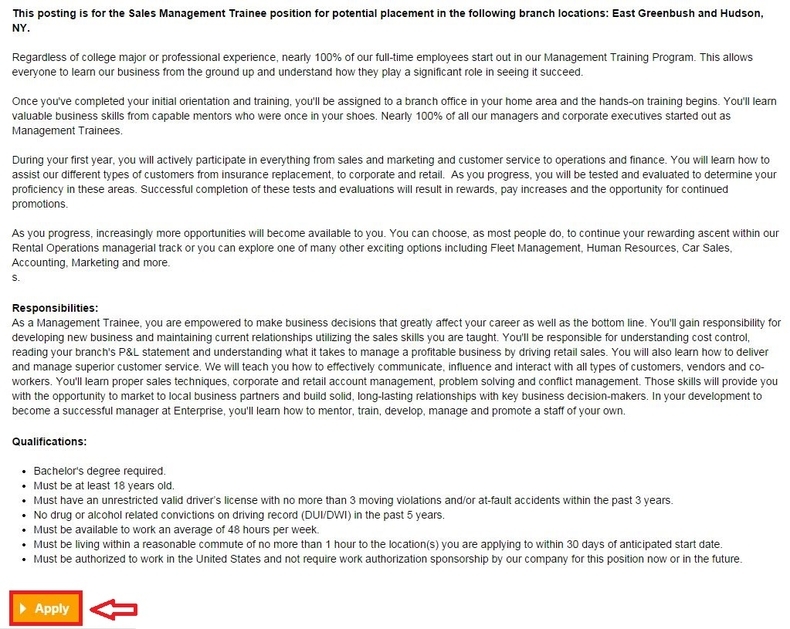 Click enterprise.com/careers to apply for Enterprise Rent-A-Car jobs online.